"Troy, I'm excited to tell you how handy your tool was for our plumbing crew. We had to drill holes through a cement wall on the third floor of an apartment.. 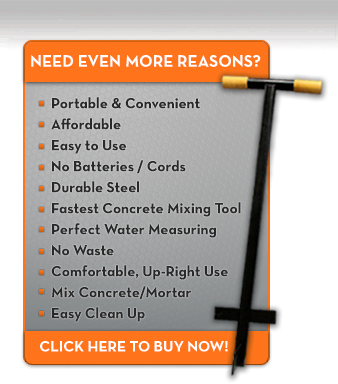 Being able to mix a batch of concrete up there was so easy with your tool." "Your tool / bucket idea is excellent! I helped my kids make stepping stones for our garden. It was EASY! And FAST!" "Thank you for your advice on repairing our sidewalk. We thought we'd need so much more equipment to get the job done. You saved us time and money with your product." "What a time-saver your gadget turned out to be! We had to replace the cap stone & several bricks on our chimney. We mixed the mortar in the bucket and then hoisted it up the ladder. No other tools needed! Thanks!" "We are so pleased with our new fence! Just wanted to thank you for the professional installation and how neat you kept the work site. We expected the new sod to get trampled and ruined. Pete and I were impressed by the simple, clean methods you used to mix the cement for the metal posts. Very clever! "